Rut-cation is over. No more 4 am alarms, no more long hikes with heavy gear in the morning darkness, and no more long sits with no deer movement. By most people’s standards this is the description of a miserable vacation. To us whitetail addicts, it’s simply the cost of doing business and we love it. My official rut-cation began the first week of November and I had 10 days in the timber in early November to take one of the target bucks on our property. I was also looking to take a doe helping to reduce our overall doe population—and put meat in the freezer. 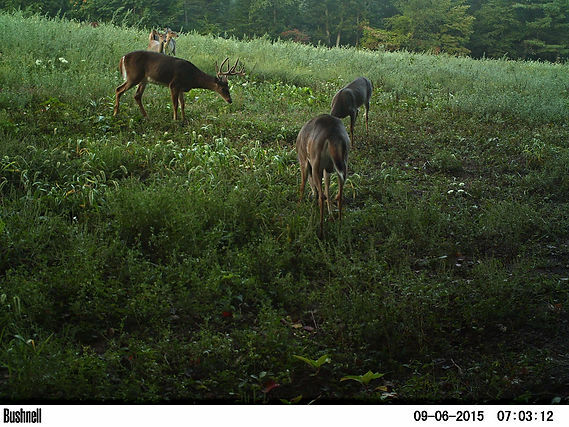 I identified four bucks as my targets during the course of the summer, fall and earlier season hunts. Below are a few pictures of the identified. The two on the right were our shooters and were identified during the summer months. Both of these guys stuck around our property throughout the season. The one in the middle is Jeff Reed, named after the fiery former Steelers kicker, due to the kicker on his left G2 making him an 11-point. 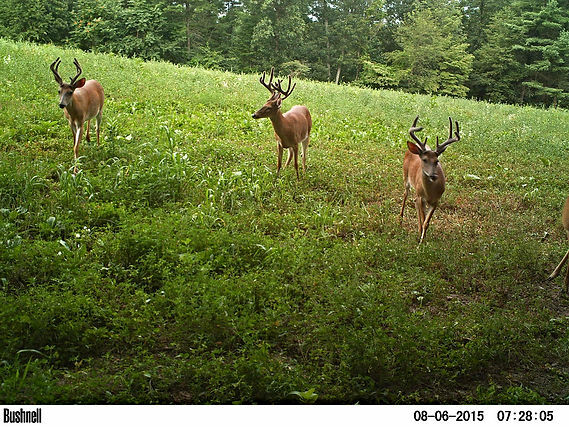 The buck on the right was just simply named 8. 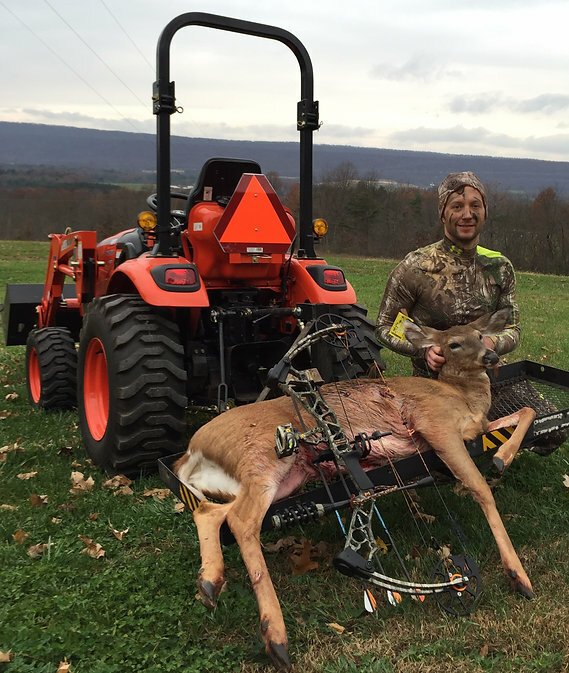 They both are younger than I had hoped, but are certainly nice deer for this area of Pennsylvania, particularly Jeff Reed. Unless he presented a “can’t resist” shot, he would get a pass this year. 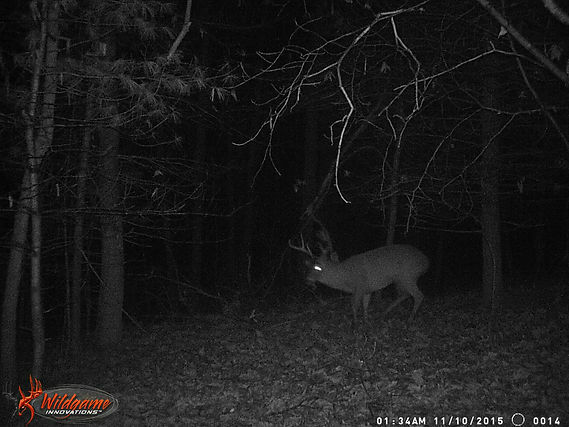 I aged him at 2.5, and he could be a really nice buck if he could make it one more year. Below are a few pictures of Jeff Reed throughout the fall. 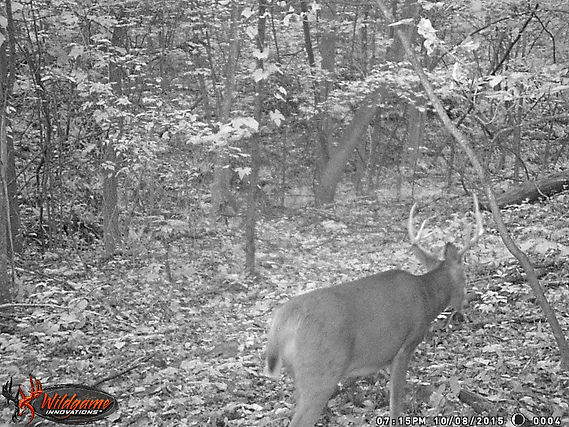 He disappeared for a while, but we did have an “on the hoof” sighting the first week of November and one additional camera image of him that month. Our live sighting was on the opposite side of the property from where we had been seeing him during the summer and early fall. I had only one additional picture of my targeted 8 point in the image above. He was also sighted “on the hoof” on 2 occasions during the season. These sightings and this additional image, gave me a pretty good idea of where he may be living. The time on the photo below is incorrect, it should be 7:15 am. Later in the season I had a late addition 8 point added to my target list. 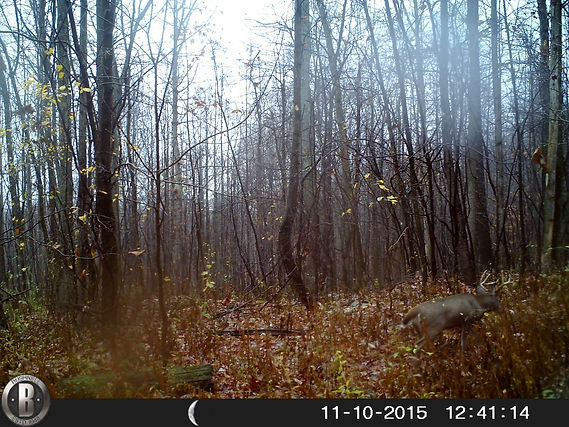 I had multiple daylight pictures of this guy running this same trail between two micro food plots. And finally, Dirty Harry. 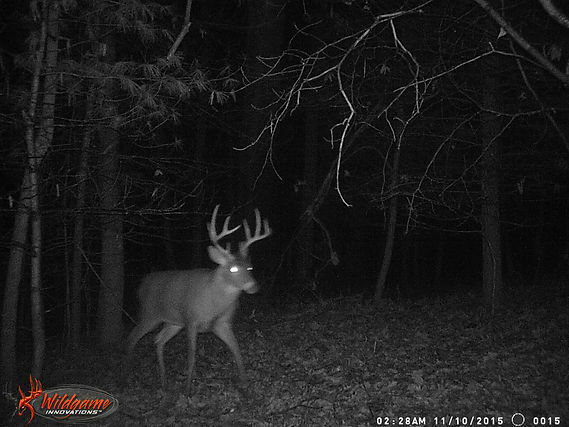 This guy’s rack may not be all that impressive, as he’s a big 6, but his body is huge for a Pennsylvania deer. He is the oldest deer I had on camera, I’m thinking he’s about 3.5 years old, but the latest picture I had of him made me think he may be a 4.5. 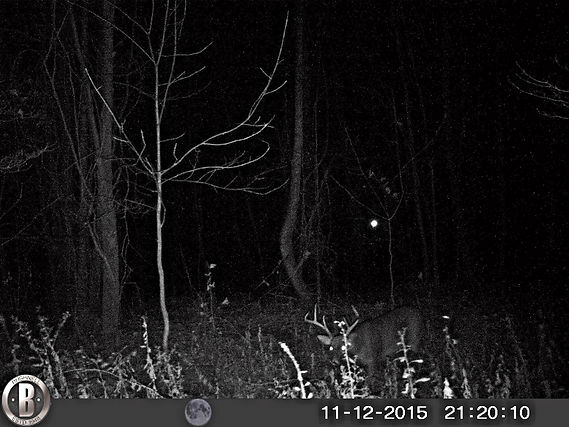 We had no pictures or sightings of him until he showed up tending a mock-scrape I made in late October. I typically take the same period of time off from work each year as my rut-cation at the beginning of November. This year was no different. After work on Friday October 30th, I quickly packed my car and headed west on the Pennsylvania turnpike for my 3 hour drive to our farm. A lot of work had been done at the farm this year to enhance the habitat. I had done more preparation this year than any other season before, and was hoping this work would pay off. As I pulled into the cabin, I could see there was a deer hanging beneath the deck. My father-in-law had taken a doe that evening. It seemed like a good start to the next two weeks. Saturday’s weather looked good, not as cold as I’d like, but in comparison to what was coming later in the week, it seemed like one of the better days to try to fill my buck tag. I had a camera image of the one 8 point I had targeted and live sightings that told me he was cruising a hollow between a doe bedding area and a clover field. I climbed a tree in this hollow Saturday morning and was shut out on the day–nothing. Not a single doe. This was unusual as this hollow has historically been a heavily used travel corridor. There is no hunting allowed in Pennsylvania on Sundays, so I used this as an opportunity to check game cams, freshen up some mock scrapes, and do some scouting since it had been a few weeks since I had last been to the farm. Based on the the camera image of the 8 point above (10/8 image) and some live sightings, I had an idea where he may be living. I found a few scrapes, and then his rub line that ran the length of a ridge into a pine thicket. Along the mid-point of the ridge and and again 300 yards further to the point, I found 2 classic buck beds. I studied the camera data, and looked back at the dates of the live sightings and realized every time he’s been sighted and traveling this particular area was on a west wind. I looked at the upcoming weather and like most of the deer hunting country, we were set to have some unseasonably warm weather during the next few days. Monday’s wind wasn’t right for me to hunt the point of this ridge, but Tuesday had a west wind coming in, and it was the last morning of “cooler” weather before the temps jumped. Before I set out on Tuesday, I learned a friend was coming to camp to turkey hunt Tuesday morning. I had a west wind on Wednesday as well, and decided to head to the creek bottom of the property Tuesday morning instead of the ridge point. Hunting the creek bottom as an observation set was an attempt at keeping the pressure to a minimum on the point I had determined was likely my 8 points’ bedroom. Unfortunately, during the turkey hunt that took place, my target buck was jumped from his bed on the ridge point, and was never seen again during the next two weeks. I’d be lying if I said I wasn’t disappointed in the outcome of that morning. I had spent hours, beginning in the summer, checking trail cameras, planting food plots, moving cameras, making mock scrapes, and scouting, with the hope that I’d have enough information line up to make a good attempt on a nice buck I had specifically targeted. Even with this misfortune, there were still hunts to be had. The next few days were warm and deer movement came to a screeching halt. 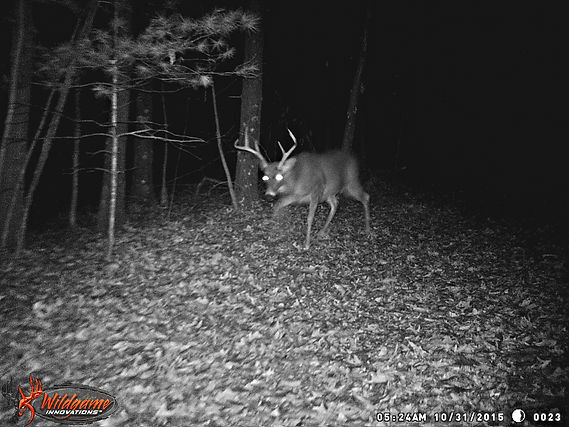 I know anecdotally, warmer temperatures typically will reduce deer movement—even though QDMA studies say temperature has no impact on movement (good podcast discussing this and more rut info here). With that being said, I’ve never been shutout on so many hunts as I had this year. Historical hotspots we’re completely dead. And then it dawned on us what we might be experiencing. We have a 5 acre clover plot that is the green food source on our property, and is really the only source of consistent food once the corn comes off in late September. These cut cornfields are then sewn with winter wheat, and typically never sprout due to the cooler fall weather. This year the winter wheat was put in slightly earlier than usual and the rainy and warmer weather this fall allowed the wheat to actually come up to the point that it provided an additional food source—the deer didn’t need to travel for food and were bedding in brush right off the edges of these fields. Once we adjusted, we began to see deer and my father-in law had two encounters with Jeff Reed—but no shot. As my rut-cation was coming to an end, I had gotten over the disappointment of my target 8-point being bumped. I hadn’t had any encounters with shooters, and was at this point looking to take a doe just to put meat in the freezer. I set out Saturday morning (my last day) to hunt a brushy hollow near the clover field. There were consistently a few deer feeding at the top of the clover field in the late morning and I had hypothesized that they were using this hollow to get there. It was really a Hail Mary, but this hollow would allow deer to remain under cover as they came off the mountain. I picked out a poplar tree and climbed to about 25 feet. At 7:30 am I heard something approaching from behind me and to my left. I thought it was a couple squirrels but looked over my shoulder to see two deer approaching me. I didn’t have time to turn on my camera as they were close and waited until the lead doe’s head was behind a tree to grab my bow from the hanger. She cleared that tree and gave me a 25 yard broadside shot. I didn’t have time to stand, so I gave her a quick mouth bleat and released the arrow. She made it 40 yards before she expired. It’s pretty amazing how quickly one’s fortune can change in the timber. In 30 seconds I went from thinking I was going home empty to getting a kill. This was one of the toughest, and most mentally challenging archery seasons I’ve had. I’m thankful for the doe, as she saved my rut-cation. And looking back, my hunt was more successful than I probably realized at the time. I had never patterned a buck before and all my work leading up to the season did pay off. I was correct about my 8 points’ bedding location, and the wind he’d travel on. And the doe is helping me to continue to build confidence in my shot for when I put all the pieces together for my future moment of truth from the stand.